TraderMoni FQA and answers to them – Trader Moni is the FG initiative to empower petty traders with no interest loan that will aid them expand their business/trade. Till date some beneficiaries or prospective beneficiaries still ask some question all the time concerning the Trader Moni FG Loan programme, which we will be answering in this post. As of the records, this initiative has visited about 32 states, 40 Urban Markets in Nigeria six Geopolitical zones. There are lots of questions asked by most of our viewers which this article will go through in couple of minutes now. 0.2 Is Ten Thousand Naira (10k) the least loan I can collect? 0.6 Is trader Moni a Bank of Industry (BOI) Loan? TraderMoni is a loan programme of the Federal Government, established for the sake of petty traders and artisans across Nigeria. It’s a part of the Government Enterprise and Empowerment Programme (GEEP) Scheme of the Nigerian Government,being executed by the Bank of Industry. 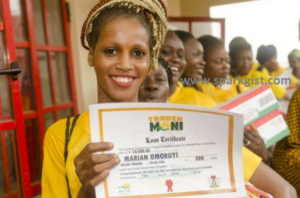 Trader Moni gives an interest FREE loan from N10,000 and growing all the way to N100,000 as you pay back you loan on time. You get N10,000 as the first loan. When you pay back the first loan, you immediately qualify for a second loan of N15,000. After payback of the second loan, you qualify for a N20,000 loan, and thenN50,000, and then N100,000. With TraderMoni, the Federal Government wants to change your level by providing continuous loans for your petty business, making each loan bigger to enable you to grow. Is Ten Thousand Naira (10k) the least loan I can collect? No……. you loan grows as you pay back! You can get up to N100,000. If you loan the first trader moni N10,000, trade with it well and pay back in time, you get N15,000, and then N20,000, and then N50,000, and then N100,000. After paying back your loan within 3 months time, your next loan is automatic. All you need to do is to dial a code on your phone and you move to the next higher loan immediately. Federal Government know the importance of this money to the life of 20million petty traders out there and the impact it will create in their life and reducing poverty and unemployment level in Nigeria and individuals that needs to grow their business These Nigerians rarely have bank accounts, and are usually not “interesting”or “profitable” to traditional lenders. They cannot access loans to trade, and they therefore remain in a cycle of poverty. Federal Government is on a mission to break this poverty cycle. TraderMoni can ease your “business cash” problems and make your life better. Is trader Moni a Bank of Industry (BOI) Loan? NO. TraderMoni is a loan from the Federal Government of Nigeria. The loan is only being monitored or supervised by BOI, being a bank with the structures and processes to reach out applicants that need loan to grow their future.